The soup is a perfect first for the winter: rich in vitamins, warms the evenings and solves the dinner. If you present it in a crispy casket, the effect is guaranteed! Tired of the sad minestrone that is cooked once a week just to consume the right dose of vegetable? Here is a special solution to turn the soup into an appetizing first, complete and beautiful to look at. Try to serve it in bread: it will not be the usual one soup! It will have happened to you, if you have been on holiday for example to Budapest or a Prague, that you were served the beff stew typical of Hungary, the typical Hungarian dish consisting of beef stew, peppers and potatoes, flavored with tomato and paprika, in a loaf of bread. It is indeed a tradition to associate the crispness of the bread with the warmth and flavor of the meat. 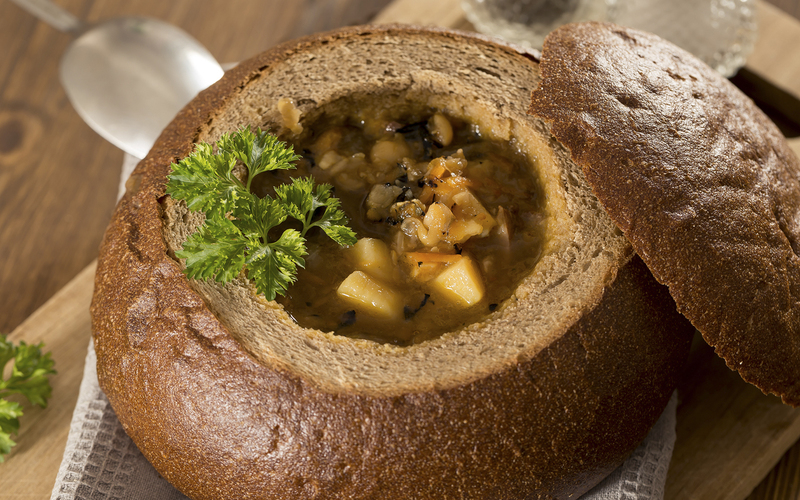 Also in Poland you do the same, with a dish called Zurek, an ancient soup made with rye flour, legumes, potatoes, sausage and eggs. A real full of energy to combat the cold of these lands. How to choose the right bread for the soup? Each diner will have his loaf, so it is important to choose the most suitable one. Serve a crisp and rather hard bread, to prevent the heat of the soup to melt and soften. The right diameter for the bread it's about 15 centimeterswhile the type of flour is that of durum wheat or rye or integral. You can ask your local baker for advice, or to prepare ad hoc pouches to make sure of the result. It will be enough then cut the upper cap and digging bread by removing the breadcrumbs. toast then the bread in the oven for about ten minutes. What soup do I serve in bread? The simple ones vegetable velvety they are perfect to serve in loaves, but they also fit well vegetable soups and cereal, like the barley and lentil soup or that of spelled, cabbage and potatoes. This recipe has already been read 45 times!